This. 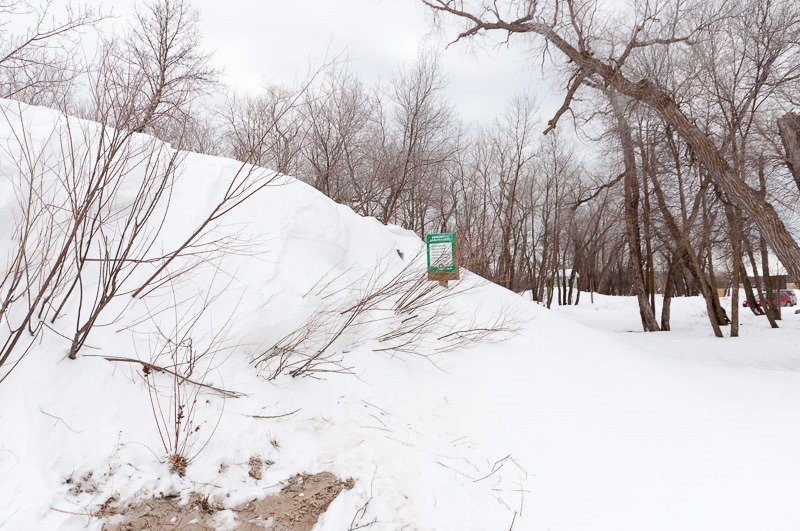 Some people will complain about a mere 10cm of snow, some can retain themselves until 60cm. 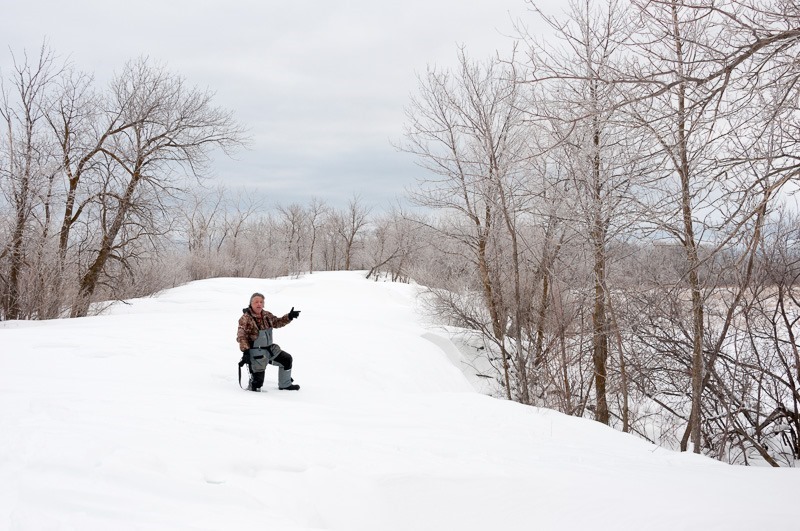 But here, you have to enjoy the mere 6 meters of snow near Lake Winnipeg. 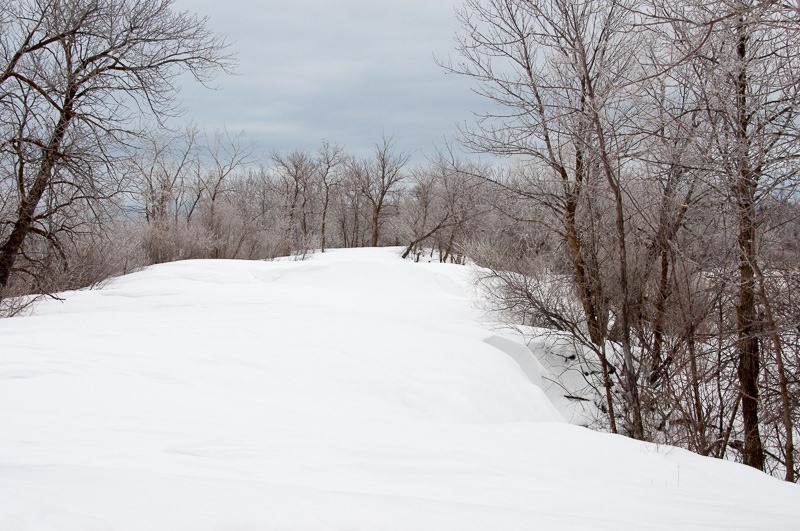 Ok, hopefully this will be the last time this season that I will be blogging about snow. Perhaps a few about times about ice, but no more snow. We have all been “complaining” about the time it takes for winter to move away. But let’s not forget that last year around this time, the Canada Geese were already here and they were already starting to ensure the next generation. All that by a balmy +15C to +20C. And we all spoke about it, blogged about it, filmed it and photographed it. Seemingly we have already forgotten last year. For me, last year was an exception. 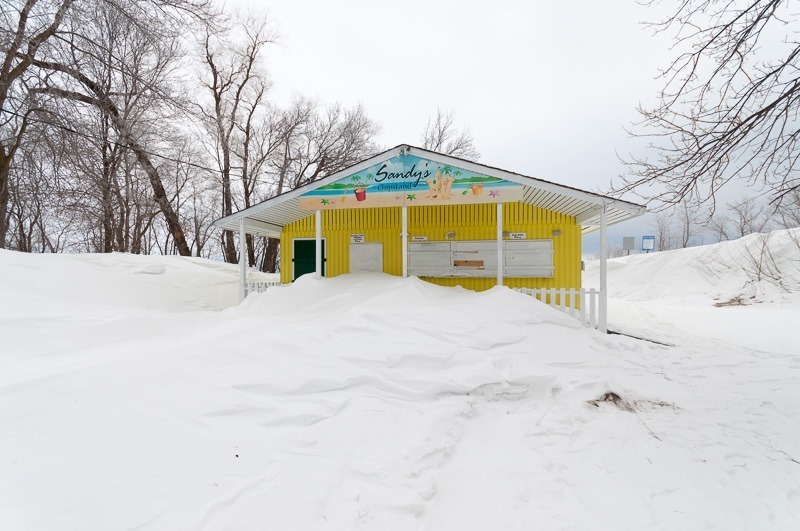 After all, you don’t go to Canada, live in Manitoba and expect tropical weather. So, here you have it. Snow as far as the eye can see, even if you take a plane… So let’s go and enjoy that snow for as long as it’s here. 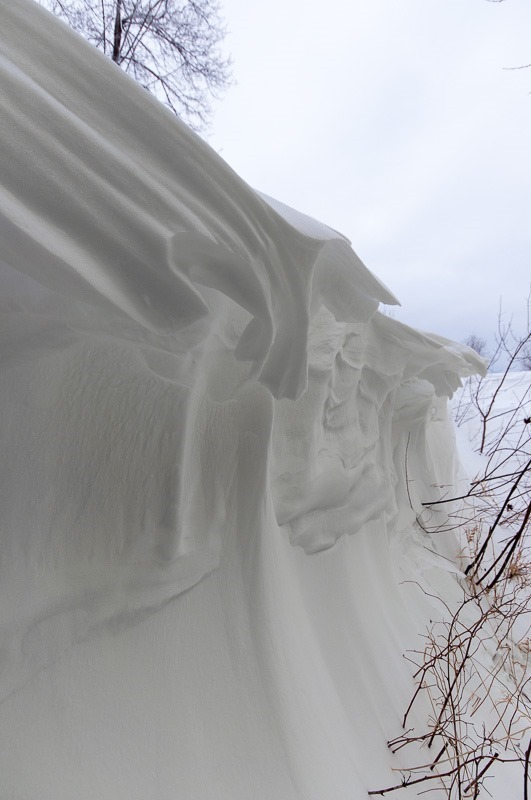 The above picture does not give you a sense of scale, it’s hard to believe that there is about 6 meters of snow there. So I decided to take another picture. The guy up to his knees in the snow is standing there about halfway up to the height of these trees. That makes it about 6 meters off the solid ground. Of course this snow did not simply fall there, that would have been too much. 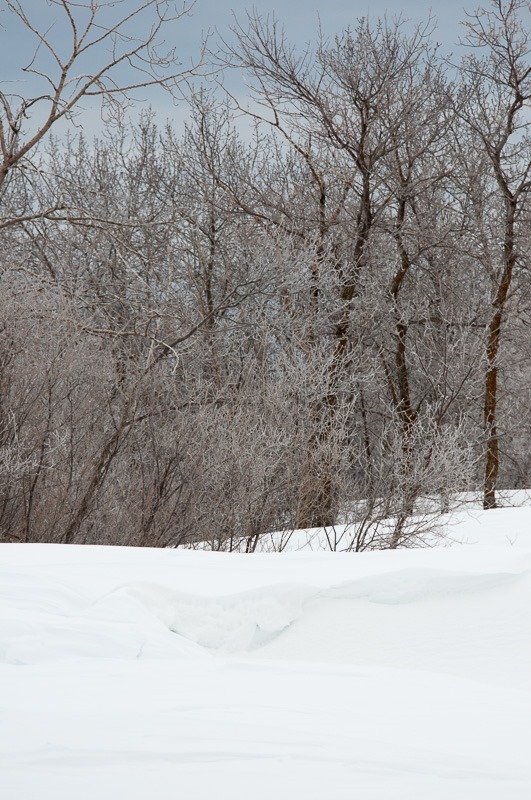 These are snow drifts, snow blown off of Lake Winnipeg and caught in the lee of these trees. After a few blizzards, that snow starts to add up. 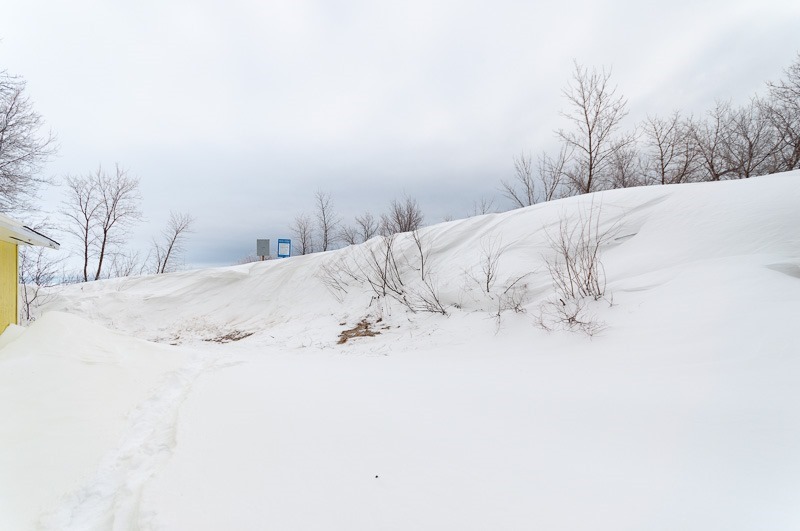 Over time, the top part of the snow melts and hardens, even by temperatures of –20C. Walking on top of them should then be easy. However, with the last blizzard only a few days old, the snow here didn’t have the time yet to become passable and we got stuck only a few meters away from the parking lot. At some point we were up to our hips in that snow and getting out of there seemed like a bit of a hazard. So we decided to be more intelligent than persistent and turned back. If you look closely at the picture above, you can see a red car in the background. 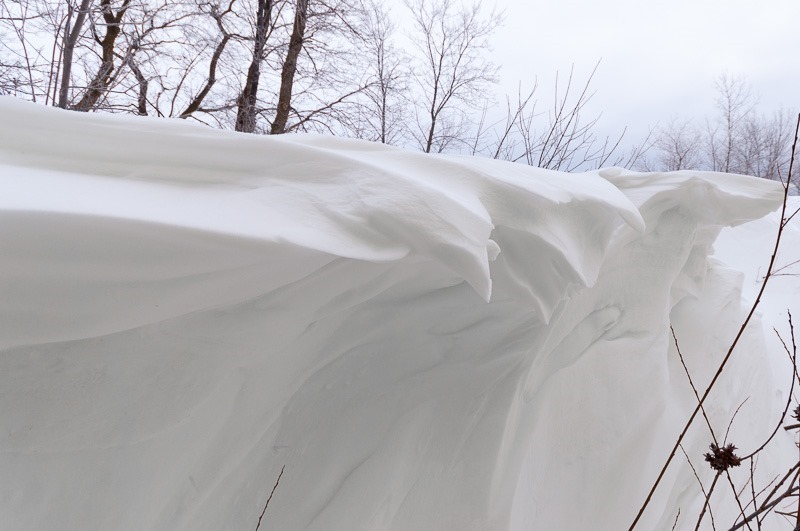 The snow bank in the foreground was easily 4-5 meters high. The foreground gives you the usual summer colour of the place, a sandy beach! Looking back from the position of the little red VW Golf, the view again seems to have no scale. With more snow and wind on the way, we decided not to venture out on the lake either. Even with 1-2m of ice under your feet, walking in the snow on the lake can be a dangerous adventure. No use in getting in trouble for a small walk. So what about that little yellow building?